In 1941, artist Marc Chagall and his wife, Bella, were able to escape Nazi-occupied Paris for New York City, at the invitation of Museum of Modern Art director Alfred Barr. Their daughter Ida and her husband followed them to the United States, bringing with them a fully packed crate of Chagall’s paintings. A new exhibition, Chagall: Love, War, and Exile, focuses on an important but previously neglected period in the artist’s career—from his years in Paris during the rise of Fascism in the 1930s through his time in exile in New York, from 1941 to 1948. On view at The Jewish Museum in New York City September 15, 2013–February 2, 2014, the show will feature paintings, works on paper and selected letters, poems and photographs. After learning of the liberation of Paris in August 1944, Chagall and Bella made plans to return to France. But just weeks before their scheduled departure, Bella became ill with a viral infection and suddenly died. “Everything went black before my eyes,” Chagall wrote of her death. “I am lost.” Despondent and unable to paint, the artist canceled his plans to return to Paris. In 1945, distressed by her father’s state of mind, Chagall’s daughter hired a young French-speaking woman to look after him. The daughter of a British diplomat, the attractive and engaging Virginia Haggard McNeil had studied art in Paris and known such artists as Giacometti and Miró. Now married to an impoverished painter, McNeil was supporting her husband and their young daughter by working as a housekeeper. In time, Chagall and McNeil became romantically involved, and in early 1946 they moved, along with her daughter, to High Falls in New York’s Catskills. Later that year, their son, David (named in memory of Chagall’s brother), was born. During this time of great joy, writes the show’s curator, Susan Tumarkin Goodman, Chagall painted some of his most important American works. 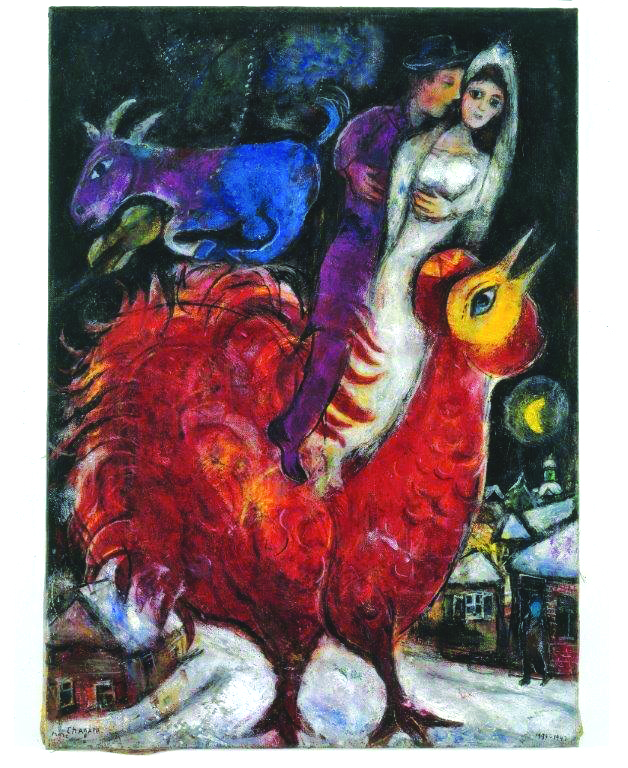 That spring also marked the opening of a major exhibition of Chagall’s paintings at the Museum of Modern Art.